Isaac and David never thought they’d go back to the Amish world. But when Isaac’s younger brother is stricken with cancer, they don’t hesitate to return. Their relationship is on the rocks after insecurity and fear drove a wedge between them in San Francisco, and David is determined to make things right. Yet if they thought navigating “English” life was confusing, being back in Zebulon is even more complicated. Their families are desperate to bring them back into the fold, and pressure from the community builds. Isaac and David yearn for a future together, but each day it becomes harder to hide the truth about who they really are. They’re caught between two worlds, and if they’re not careful it could tear them further apart. This is the final chapter in a trilogy of forbidden Amish love. I have to be honest. I really did not want to read this book. BECAUSE I DIDN’T WANT THIS SERIES TO END!!!! Book 3 is the final installment of the Gay Amish Romance series and we’ve followed David & Isaac through first love, forbidden love, running away, living “English”, struggling to assimilate, miscommunication, arguments, and now…cancer. Good lord, this author puts us through the ringer with the boys. But, I’d gladly go there…just so I can experience their love…for their families, for each other, for what’s right. You can’t read book 3 as a standalone, so rather than review the book, I’m just gonna gush over the characters and the series. I was terrified of the two of them going back to their Amish homes. I was worried for Nathan’s health. I was so scared for Aaron (ugh…Aaron’s story in this book BROKE my heart!). I was curious about how the famililes were getting along w/o them. I was anxious about how the guilt of being home would come between David & Isaac. I was concerned how the boys would work through their recent problems. And Keira Andrews took me, the reader, hand-in-hand through all of it. I felt cared for while reading it. I felt assured that David & Isaac would find “a way home”. And it was the perfect ending for them. Even the slightly too-good-to-be-true epilogue worked for me. It’s what I wanted for the boys all along. 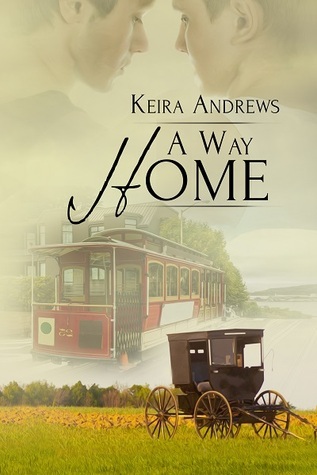 This entry was posted on April 9, 2015 by susan in Contemporary, Reviewer: Susan and tagged 4.5 Stars, amish, keira andrews, self-pub.